Roberto Luongo – The two goals in 23 seconds was exciting, as were the shootout exploits by two of the club’s young talents, but if Lou doesn’t stand tall in net, especially in a bizarre first period that saw Ottawa fire 20 shots on goal that led to absolutely nothing, then this game goes down as something like a 5-2 loss or worse. I’ve covered a lot of spring training baseball the last month, and I’ve not seen any ballplayer flash the leather like Luongo did Tuesday. Not speedy center fielder Matt den Dekker of the New York Mets, a Ft. Lauderdale native – just check out this catch in the 2010 College World Series: http://www.youtube.com/watch?v=zSZf6o7rM58 – or third baseman Ryan Zimmerman or outfielder Bryce Harper of the Washington Nationals. Nothing I’ve seen was as good as Luongo was. Repeatedly the Senators tried to beat Luongo high on his glove side, and they failed almost all the time. Fittingly, the game ended with him shutting down Milan Michalek on a backhander that found Luongo’s webbing. “That’s good for me. That’s where I like to make a lot of saves,” said Luongo, who had 37 of them. Without Lou’s first-star efforts, Florida (27-38-8) doesn’t beat the desperate Senators. It’s that simple. Vincent Trocheck and Brandon Pirri – Trocheck’s third career marker on a pass from Scottie Upshall capped a two-goal, 23-second comeback and really got the crowd buzzing. Trocheck has scored on an empty-netter, a wrap-around and now a hard charge to the net on a 2-on-1 break that started with him keeping his feet moving, feeding the puck around behind Luongo and getting on a rush with Uppy. Pirri was solid throughout and appears to have a scorer’s mentality, which is truly needed on this pass-first team that appears rather hesitant to shoot at times like in the 4-on-3 power play in overtime. The two paired up in the shootout to produce two slick goals and provide the offense that lifted the Cats to the win. Many fans denounce the shootout and call it gimmicky. That’s fine. Regardless, the Panthers are suddenly becoming very good at it and stand at 8-6 in the 1-on-1 skill session. What they’re also doing is creating incredible depth in the shootout. 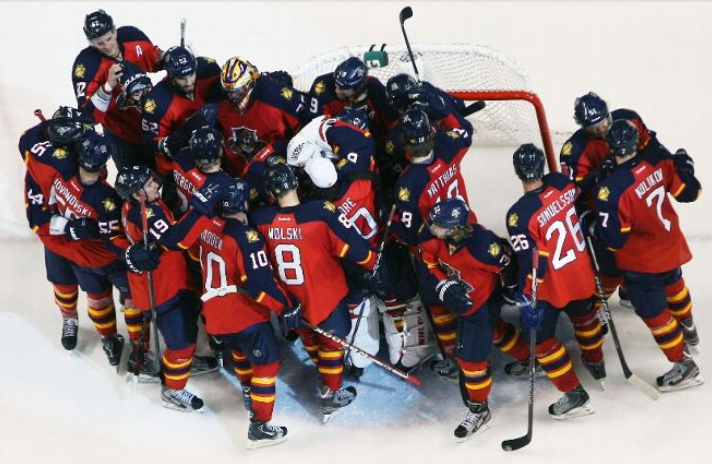 Next year the team’s 1-5 shootout specialists could be Jonathan Huberdeau, Aleksander Barkov, all-time NHL leader Brad Boyes, Trocheck and Pirri – and perhaps an additional winger or two most expect the Panthers to go after in free agency on July 1. That group will get you the extra point more often than not, and we all know that’s often the difference in making the playoffs. “I was shocked to see that I’d go first (in the shootout). When he said I was going first, I was a little nervous, but luckily it worked out. That’s my go-to move. Luckily there’s no video of me doing it in the NHL,” said Trocheck of his first shootout attempt in his 11th game. Following the contest, Florida interim head coach Peter Horachek had some very complimentary words of praise for Trocheck. The two started the season together in San Antonio, and Horachek said he was impressed by the Pittsburgh native from the start and loved his compete level. Horachek may or may not be the head of Florida when this season concludes. GM Dale Tallon relieved assistant GM Mike Santos of his duties earlier in the day, and Santos, who joined the organization in 2010 after being directory of hockey operations in Nashville, was instrumental in bringing along Horachek. Who will be behind Florida’s bench next season is an unknown, and probably becomes even more of a dicey decision if Peter Laviolette, Guy Boucher, Claude Noel and other coaches are available and the organization is truly committed to spending money to ice a winning team. I don’t know if Horachek will be back, but I do know I want no part of any transaction that would ship out Trocheck and/or Pirri anywhere to bring back anything deemed more valuable. Trocheck has too much upside and should have nights like Tuesday for years to come in a Cats’ sweater. As for Pirri, Tallon’s likely already won that deal with Chicago – and that’s not even mentioning the two other former Blackhawks he dealt for in Olsen and Hayes. That deal looks more than favorable as well. Again, these are small snapshots in a game in front of just 13,435 fans, but all things considered, the pictures from Tuesday night came out just fine.